Smaller than Horn-eyed Ghost Crab. 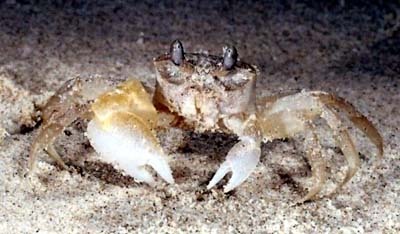 Mottled, no horned eyes; lacks narrow row of close-set ridges on inside of claw (‘musical crest’) that other Ocypode species rasp to make sound. 10–20 mm across, but can reach 35 mm. From top of frontal dunes to about 200 m inland. Often seen scurrying about beach campsites. Northern Australia from Kimberley, WA, to northern NSW; East Africa to Tahiti, north to Japan.